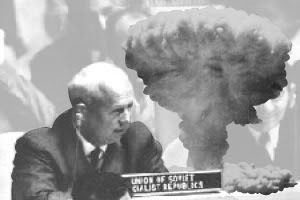 I witnessed Khruschev on television in September 1960 banging his right shoe on the desk at the United Nations screaming “We will bury you!”. Many Americans took the threat very seriously imagining all out nuclear war; underground bunker salespeople made a fortune. Some Mainers went the do-it-yourself route, including one of my uncles. He didn’t buy any blueprints. His nuclear resistance project became an ongoing work in progress to nuclear-proof his home. 15 years later it was still a work in progress. I recall a visit in the early years and was rather amused to hear his logic. Dang, I was only 12 and knew anything above ground would be leveled, but my uncle wouldn’t listen. Imagine sitting in his living room with no walls between rooms except exposed 2 by 4’s and sheets! After tearing everything up he realized the outer walls were the priority. The exterior walls were ripped out from the inside, and cement block replacements covered a small portion of each anywhere from 3 to 5 feet from the floor. At some point he must have worn out his enthusiasm. It looked no different 15 years later.